This challenge has been devised by ourselves and we are the only provider to offer it. We have named it the Rocky Ridge because almost the entire journey can be made without setting foot on grass. The route takes you into the most rugged terrain in the country and takes you, literally, to the roof of England! 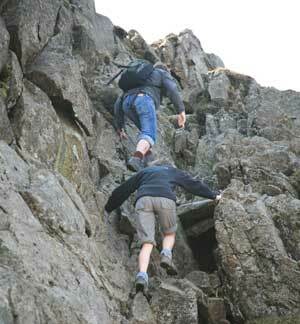 This challenge can be done in either direction but is best starting from Great Langdale and finishing in Wasdale. Doing it in this direction the terrain gets better and more exciting as you progress, culminating in the mighty Scafells! It's a tough challenge but one of the best. For those who wish there's an option of returning to your starting point by retracing your steps as opposed to descending to the opposite valley for vehicular transport back to your start point. This challenge can be done in either direction but we describe it here starting in Great Langdale and finishing in Wasdale. We commence the journey from Great Langdale and climb our first mountain Pike O'Blisco via the recently renovated Redacre Gill route. There's a minor scramble (avoidable) below the summit of our first mountain. From Pike O'Blisco our next top is Cold Pike and from there we have an easy climb towards Crinkle Crags, an extremely confusing place in mist. 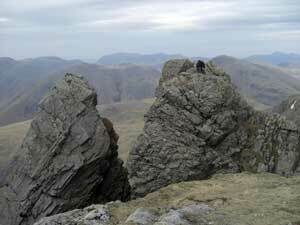 There are 5 seperate tops on the 'Crinkles' but the second one from this direction, Long Top, is the highest and official summit. There's an obstacle in the way as we approach the second 'Crinkle' - a 10 foot rock step known, affectionately as the 'Bad Step'! This is avoidable by a path going round to the left for those who don't fancy tackling it. 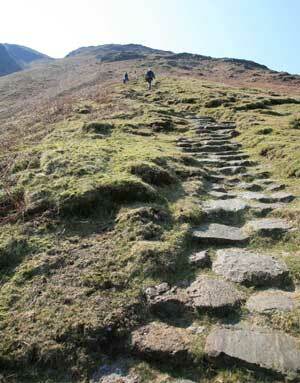 It's probably the most difficult obstacle faced on any of the regular walkers routes in Lakeland. 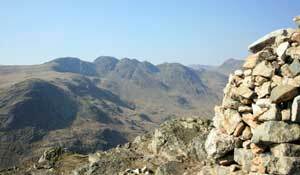 From Crinkle Crags there's a magnificent view (weather permitting) of the Scafells. The view gets even better as you progress along the ridge. 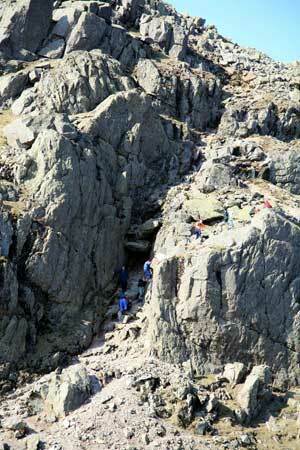 The next of our summits is Bowfell which we approach from Three Tarns. 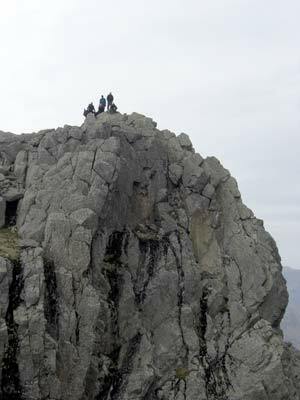 The summit of Bowfell is every bit as rugged as that of Scafell Pike, though much more compact. Just like the 'Pike' evidence of the violent volcanic activity that formed the region over millions of years is clearly on display everywhere you look. The area is a geologist's heaven! Esk Pike is our next summit and from there we descend to Esk Hause before tackling Great End, aptly named as it descends, apparently vertically, in chaotic cliffs for over 800 feet. Needless to say we avoid these and take the more 'pedestrian' route! 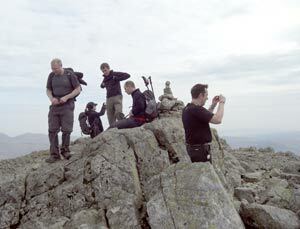 Afte visiting Great End we head for Scafell Pike. At 3,210 feet above sea level the summit is the highest land in all England and the most rugged terrain you are ever likely to encounter in Great Britain. Weather conditions here can be extreme and can change in the blink of an eye. Navigation on 'the Pike' is notoriously difficult and is the one hill on the National 3 peaks challenge that is guaranteed to highlight any weaknesses in the inexperienced or ill-prepared. 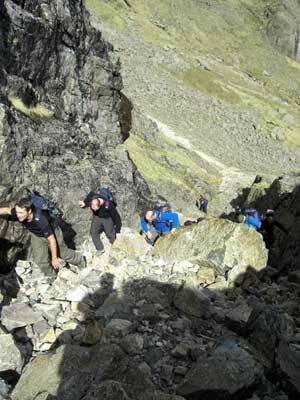 The statistics of the Wasdale Mountain Rescue team tell their own story! 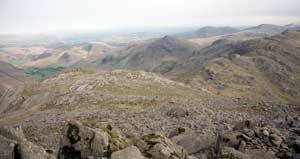 Scafell is next which, from the summit of Scafell Pike looks tantalisingly close. 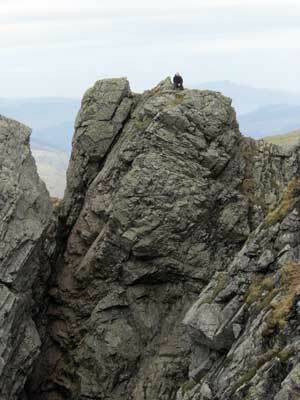 Unfortunately direct access is barred by precipitous cliffs and a considerable descent and re-ascent is necessary via Foxes Tarn. This is the only safe route to the summit for groups from this direction. 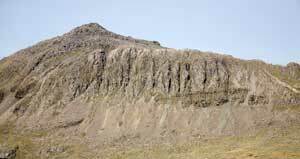 From Mickledore, the narrow ridge connecting Scafell Pike to Scafell, you're presented with what can only be described as a cathedral of rock! The sight is truly awesome and you can only marvel at the forces of nature that crafted such a place. From Mickledore we descend steep loose ground to our left and hug the base of Scafell's East buttress until we arrive at the point where we start the re-ascent. This takes us up a boulder filled gorge involving a little mild scrambling until we arrive at Foxes Tarn, which is more of a puddle really! Then it's another steep climb up loose ground and to the summit. 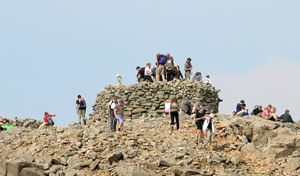 The actual summit of Scafell is a little disappointing after what you will have seen on the journey to get here. But a couple of hundred metres or so to the North and it's a different story. You're above the gills that cut deeply into the vertical cliffs with jaw dropping views into them. Deep Gill Buttress rises to your left from the depths below. 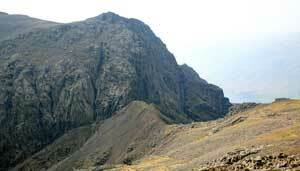 Scafell Pinnacle and Pisgah rise in front of you - Rock archtiecture at it's best! It's possible to scramble onto Deep Gill Buttress and onto Pisgah for an amazing photo opportunity. Scafell summit cairn a bit of an anti-climax after what you've gone through to get here! From the summit of Scafell we descend directly to Wasdale Head for some well earned refreshments at the Wasdale Head hotel, following which transport awaits to take you back to your accomodation. There is an option of returning to your starting point by retracing your steps rather than descending into Wasdale (or Langdale depending on your start point) but this adds significantly to your journey and the effort involved.